A less is more approach to interior wayfinding is often the most efficient, cost-effective, and aesthetically pleasing way to navigate people through an environment. 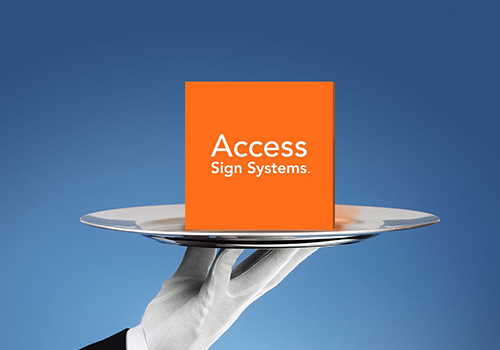 Access Sign Systems’ pre-designed product offering fits the need wonderfully. Couple this with Access Concierge Service, and AGS is happy do the sign planning work for you! Great investment! Economical price-point for high quality workmanship and materials. Form meets function with clean lines for an uncluttered aesthetic. 300 pre-designed sign types with many options for colors, typestyles and mounts. Compliant with Americans with Disabilities Act (ADA). Easy to update interior signs with paper inserts using AGS SIMplify™.